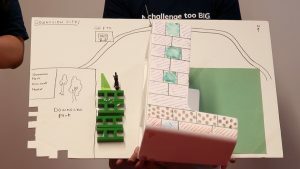 Partnered with Human Space, a division of Quadrangle, BIG IDeA hosted their fifth hackathon surrounding the future of vertical communities and what is needed to create accessible and adaptable spaces that fit different peoples’ needs. Improvement Areas) and neighbourhoods. What are the ripple effects that a large development can have on its surrounding neighbourhood? 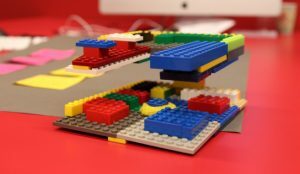 How can design amplify the positive contributions? What does intergenerational living look like, and how do we plan for providing supported and market rate units? 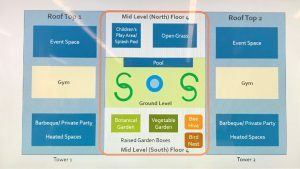 What are the factors that go into designing a family-friendly suite, such as stroller storage and play spaces? How do we build community by allowing for a mix of neighbours? Portes Ouvertes created a floorplan of a vertical living space where spaces were sectioned off to fit the needs of a growing community. They included many modes of adaptable furniture and added movable walls into the space so that areas could be modified. In the more publicly accessed floors they designed the space so that it was adaptable and open, creating a sense of community within the building as well as the surrounding neighbourhood. 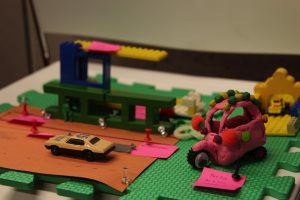 What decisions and big moves can be made early on to find a location and develop a site which is inclusive, connected, and resilient? What does a vertical community want in a neighbourhood? What can it bring to a neighbourhood? How can we foster positive engagement with local residents and businesses in the planning stage to create communities which are inclusive, connected and resilient, not just within the development but in the larger fabric of the neighbourhood? 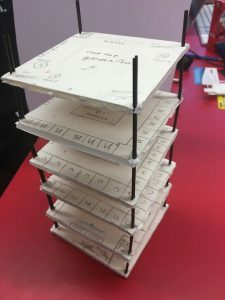 The team first defined the words “Inclusivity”, “Connected”, and “Resilient” to start framing their work. 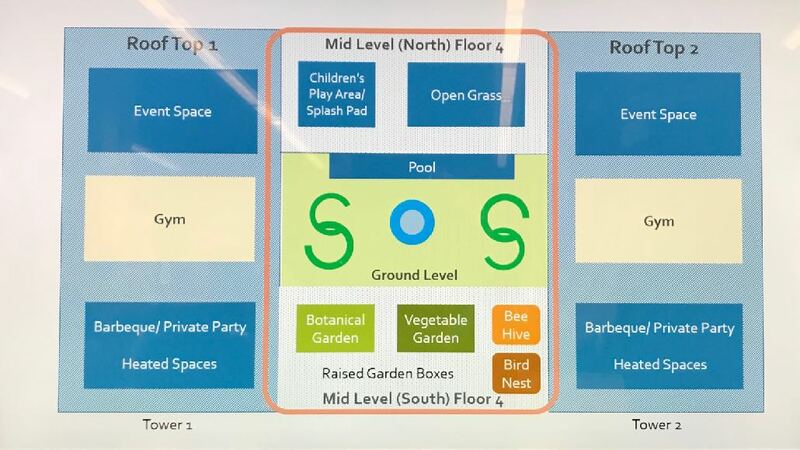 By researching the needs of a growing vertical community they found out that Downsview would be a good site to develop, focusing on the points of accessible navigation, community interaction, mobility score, and integrated work and market spaces. What considerations can be made in the design of a site, the buildings and the public and amenity spaces, to make the most out of transportation options available? How can a new development positively impact transportation for the whole area? What specific challenges are inherent in a “vertical community” itself? How does a new development create accessible, inclusive transportation options which respond to the community’s evolving needs? By looking at how space can be managed to introduce interconnectivity Tuktuk created models of how the TTC could be more accessible by developing a multiple path system with smaller communal shuttles. They took care to look at the affordances of such a system, its needs in safety, and its needs in accessibility. responsive to community needs? 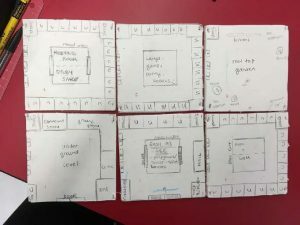 How do design and programming in exterior spaces promote an accessible, connected, and resilient community? 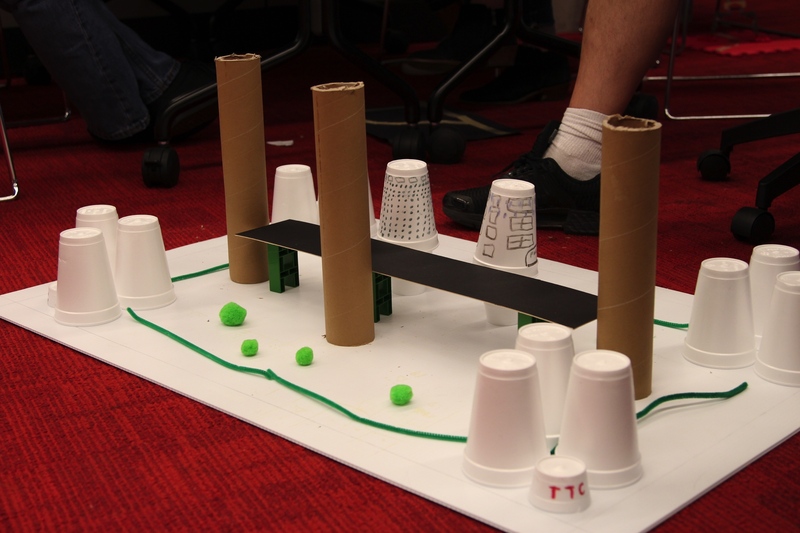 Team Sky Way created a bridge platform for a hypothetical vertical community as a recreational space outfitted with gardening areas and seating areas. They researched the needs of green space with urban environments and designed a space where residents can relax and connect. Team Connext designed an outdoor space as well as two rooftop spaces for a hypothetical vertical community and focused on not just greenery but a sustainable and mobile space that would be able to cater to resident needs and wants. New buildings typically have retail space at street level. What makes this space part of the community, and what can it do to be inclusive? What opportunity does the potential retail use have in connecting a neighbourhood with a building? 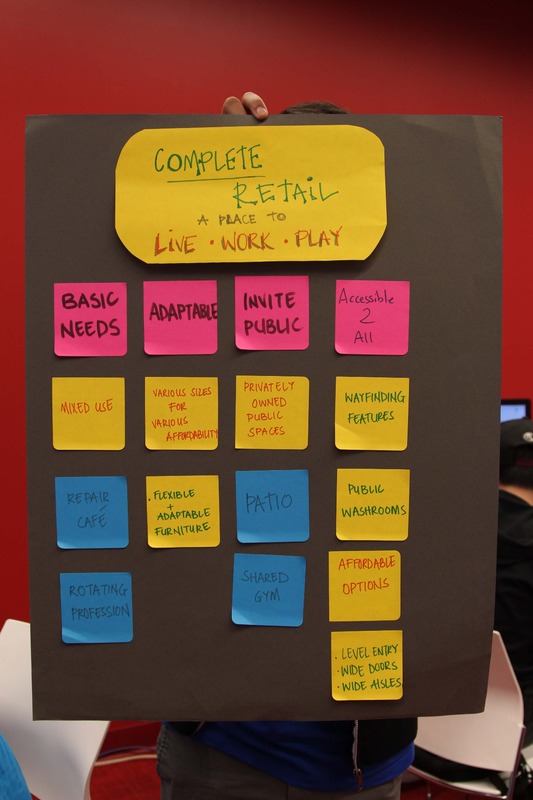 What does resilient and sustainable retail space look like? What types of retail could have a negative effect? What size of retail could be ideal? What choices can be made in the design to foster inclusive, connected retail space? Retail Therapy designed and curated a two floor space for the bottom levels of a condominium so that retail, when integrated to a vertical community, could be beneficial and accessible to the community inside and outside of the building. They listed the priorities that needed to be considered when designing and created a model to show their findings.